I wonder if there are octuple systems..
Not sure if it's still true in this version, but from what I recall there were indeed octuple ones in 0.95, but that was the limit. No nonuple ones. 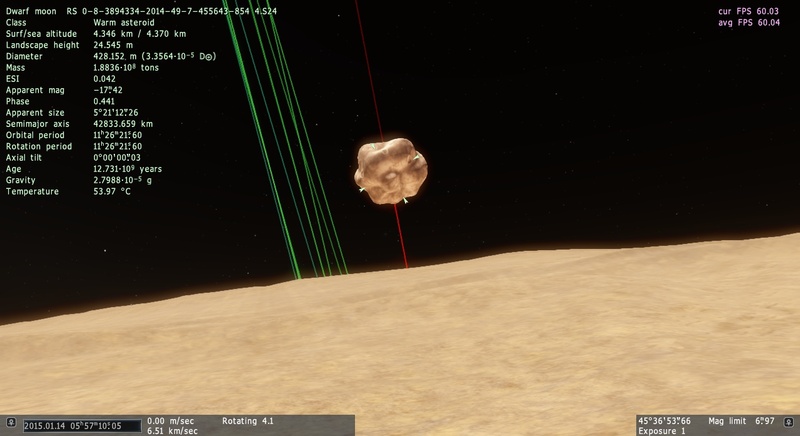 Incidentally, the Castor system is a sextuple one, so we can actually easily see one of them in real life. I was messing around and.. It would be interesting to run a large number of n-body simulations of collapsing molecular clouds / star forming regions, and plot the histogram for the number of stars formed in all stable systems that result. I am guessing it would follow some inverse power law, so each extra member becomes exceedingly more rare. Also, at some point, it stops behaving like a star system, and more like a globular cluster or a galaxy. Another interesting note is that, if taken very seriously, then the n-body stability logic I employed earlier would suggest that globulars and galaxies are not stable. So obviously the logic isn't perfect, right? Actually, no, the logic works and these are not dynamically stable objects! It's just that the instability isn't obvious except on very large timescales. 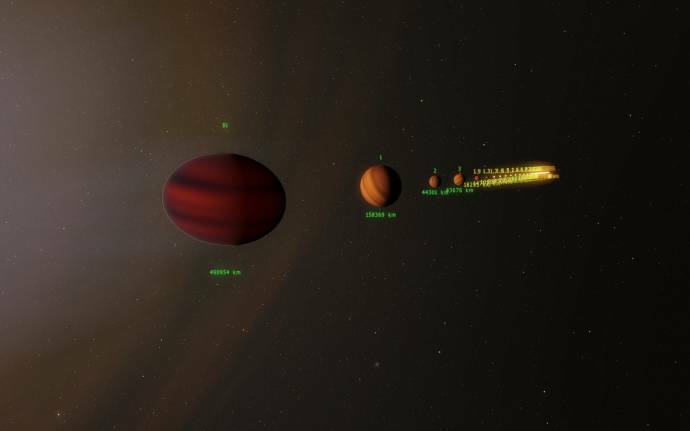 Star systems are all orbiting the galaxy rather haphazardly, with nothing preventing collisions or near misses except the vast distances between them relative to their size. But every so often systems do pass close to one another, flinging some members inward and others outward. So the long term behavior is that globular clusters and galaxies "evaporate", with stars flung into intergalactic space or feeding the central black hole. This process takes so long though that by the time it makes a significant difference, star formation has ceased and most stars have become cold remnants. Collisions between whole galaxies is also more important in the current era of the universe. Apparently it is the exactly the type of world we get there. It is ice world because program calculates the type of the world according to it's position in the system, before applying additional effects. It is warm because it is very close to it's satellite very close and tidal forces are heating the interior of the plaent. Wow, 70k search radius is a LOT. Very often that is a larger diameter than the whole galaxy! I usually search no more than 1k, and more often just 100. MalzM, the search of stars is limited not only by range but in the most times by 10000 limit of displayed stars. 30-50 ly radius is usually giving this amount, everything above that quantity is being excluded. KSpanier, and? life can be abiogenesis even in 5 planets in the same system, the life started on the planets. are you sure that you didnt found 2 panspermia and no abiogenesis in the system? if so its can be anomalies, i still didnt found system with panspermia life without abiogenesis life in the system. and its need to be out there, maybe life went from system to system? but its rare? 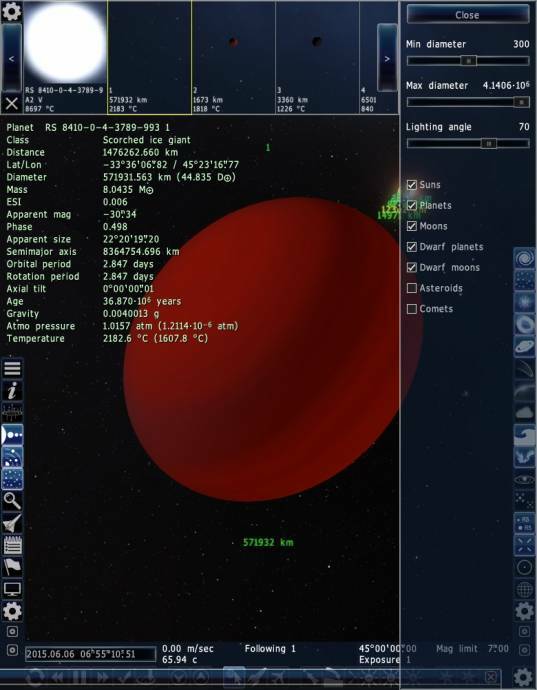 Good lord... a scorched ice giant with a diameter of almost half a million kilometers. EDIT: Apparently whenever the ridiculous ice giant is in my view, my computer starts to heat up and struggle..
Wow, good find. 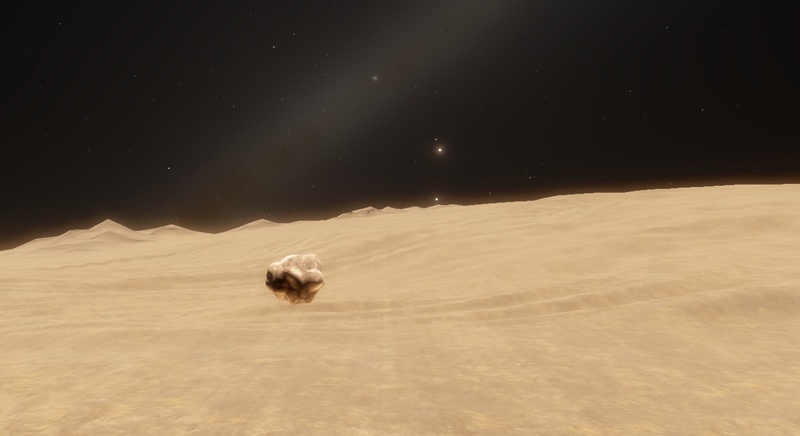 That's probably the most oblate planet I've seen. 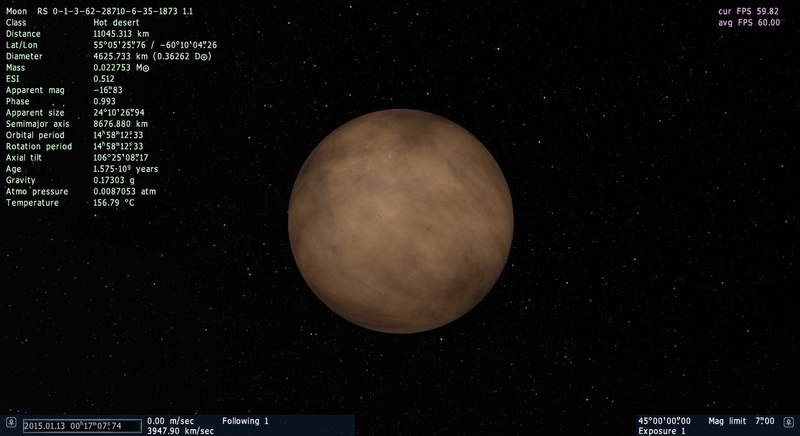 It also has only 8 earth masses, giving it a surface gravity of almost nothing. 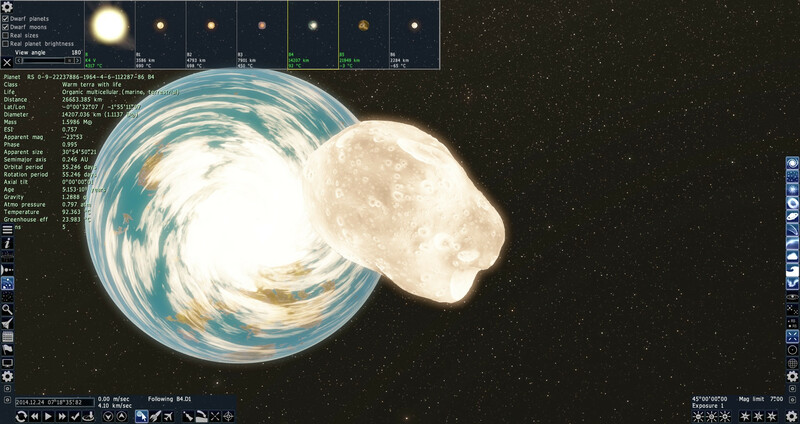 It's in such an unlikely orbit as well - around that blue giant orbiting the red giant. 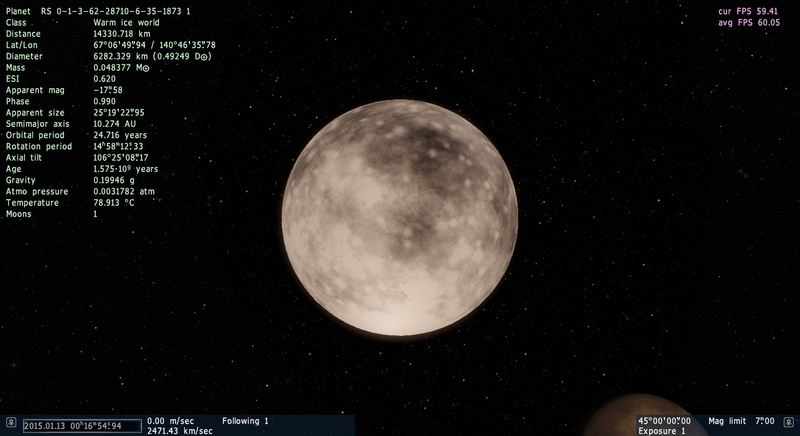 The planet next to it on the pic is slightly larger than Jupiter. Aerospacefag, looks like you are right somehow, I always believed it would only display 10000 in the list at one time, and kick the one at the end out... I really don't get the current implementation of the search, because when it's about calculation time the system seems to work through the whole defined radius... So I really don't get why it just randomly discards everything above 10k. I don't see how this is necessary. Why are these hot jupiters always so oblate? Since they're tidally locked, their rotation period should be the same as their orbital period, and nowhere near fast enough to cause such a deviation from spherical. Are there other mechanisms at play that create such oblateness?